Greetings and salutations, scoundrels and Force wielders alike! 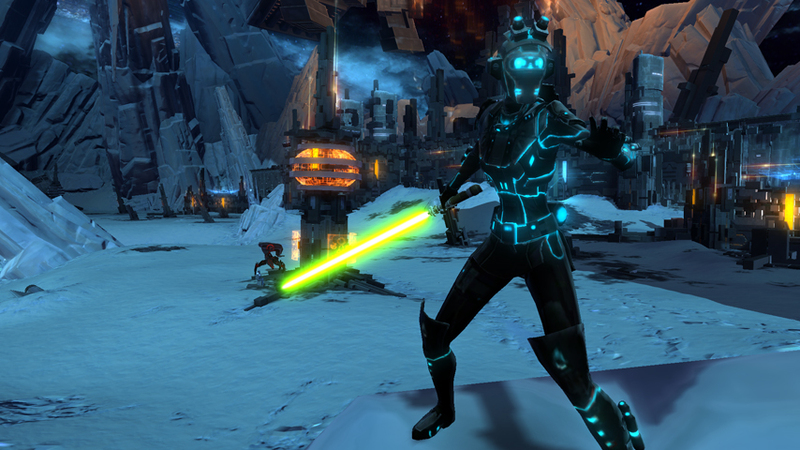 Today we’re celebrating the release of Game Update 1.7: The Return of the Gree. This update contains a brand new Reputation system, as well as a complete refactor of Ilum as part of a new, recurring event. Even better, the major contents of this patch are largely open to all -- both Free-to-Play as well as Subscribers get the benefits of the Reputation System, as well as access to the event. Our favorite cephalopods have returned! The Gree have come back to Star Wars™: The Old Republic™, specifically for the purpose of exploring an ancient vessel of their ancestors on the Western Shelf of Ilum, in hopes of seeking knowledge lost to the eons. While the Gree are on Ilum, players are encouraged to travel to Ilum in order to aid their studies and experimentation. Furthermore, the introduction of the Gree event also introduces our new event philosophy, one of recurrence. All events we run will be designed with the possibility that they may be reactivated again, and, while the Gree’s time on Ilum will be limited, we are already making plans for them to revisit multiple times over the course of this year alone. As we add additional events with this philosophy, The Old Republic will feel like a dynamic, ever changing universe for players to explore. This update also includes the introduction of a major new gameplay system: “Reputation”. All players will have a Reputation with several organizations throughout the universe. Completing missions for members of these organizations will allow players to advance their Reputation. Crossing certain Reputation thresholds will grant the player access to new titles and gear found on Reputation vendors. You know those really cool items I mentioned from the Gree event? Increasing your Reputation with the Gree is the primary way to earn them. Our Reputation System has one interesting innovation in particular, which is that Reputation is Legacy bound – advancing your Reputation on one character will increase that Reputation with all of your characters on the same server. Players should feel no need to grind up their Reputation on their alts as all of them can enjoy the benefits earned from the Reputation System. The Old Republic team considers the Legacy system a cornerstone of our design philosophy, and we felt that offering this to the players was a very natural fit. The Old Republic design team sees this as a system with a great deal of potential that will grow over time - We can also use the framework of the Reputation System to create a lot of alternate gameplay and encourage replayability. Stay tuned for more updates to the Reputation System in the future! Other than the aforementioned features, The Return of the Gree also has some important gameplay and standard bug fixes. It will also result in the inclusion of a new Cartel Pack on the Cartel Market – be sure to watch out for the new ship Droid paint job – it is awesome. Launching Star Wars: The Old Republic’s Free-to- Play option in October has proven to be successful and we’d like to thank not only our amazing development team, but also our fans and the community for their continuing support and dedication. The fans are what make this all worthwhile. Thank you for that.